APG-JAA, Tokyo. All images: Courtesy Sprueth Magers Berlin London. In 1958 Louis Malle directed his first feature film, Ascenseur pour l’échafaud (Elevator to the Gallows), starring Jeanne Moreau and featuring a mesmerizing soundtrack by jazz composer and musician Miles Davis. 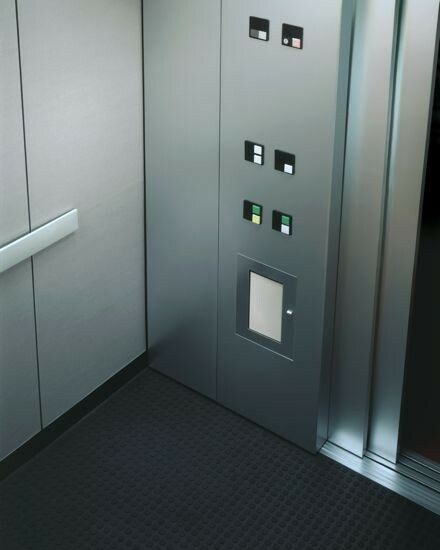 Moreau’s lover, played by Maurice Ronet, is trapped in an elevator after committing what might have been the perfect crime. This classic film noir has impressed artists from Bernd and Hilla Becher, who made mention of seeing it in 1979, to Thomas Struth, who singled it out in an interview in 1988, and Shinro Ohtake, who included it in his “cinema index” for the August 2010 issue of ART iT. (1) In the film, the suspense unfolds layer after layer, rather as another artist, Thomas Demand, operates. Demand looks at our mediatized world, where everything is recorded, and attempts to strip that world back to find the essential triggers of our memories and imaginations. Demand takes already existing images, whether those found in news photos or post cards or other ephemera, and painstakingly reconstructs their contents at life-scale out of paper before photographing his reconstructions. Given the plethora of images already available and their daily exponential increase, Demand seemingly attempts to identify the essence of what is communicated in this maelstrom of visual information, not only through building the physical structures but also through metaphorically sparking the construction of a scaffolding for the viewer’s own imagination. The viewer sees not just the image presented on the surface of the final work but also the structure of that image and, sometimes, its history as well. Demand is constantly tearing down and building up. Once he photographs his reconstructions, all of which have been assembled by hand, he destroys them. His sources are often from the history of Modernism and its overlaps with 20th-century politics, although sometimes they come from the natural world. Usually Demand photographs the structures he makes in close detail, enticing the viewer to observe the resulting images in greater depth. But what is there to observe? Demand begins with what would seemingly be a perfect vehicle for ideas, paper, but in his case the paper is, and remains, blank. In his reconstructions he removes all numbers, letters and decoration from the source images, and identity as well; people do not exist in the artist’s paper-thin and fragile imaginary. While he retains an element of color, there is nothing to distract the imagination from responding only to the structure of his completed photograph. Demand constructs an environment based on a found image that has caught his attention, but the environment he produces is life size, unlike the originating image. In catching Demand’s attention, that image acts as a trigger for his memory and imaginative interpretation, so that the process he embarks upon is one of giving the viewer a representation of his perception of a mediatized reflection of an event or object. 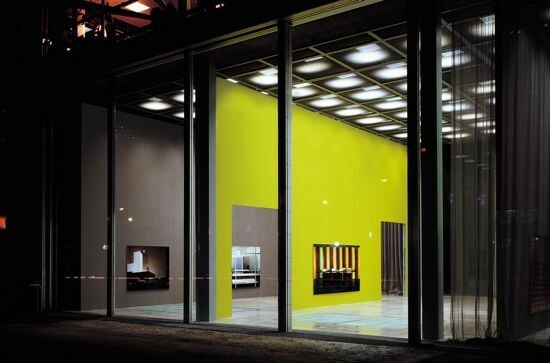 Above: Installation view, Fondation Cartier, Paris, 2000-01. © Nik Tenwiggenhorn. Below: Installation view, Serpentine Gallery, London, 2006. This layering is augmented by the way in which Demand has exhibited his work over the last 10 years. In 2000, Demand showed at the Fondation Cartier in Paris where he worked with, rather than against, architect Jean Nouvel’s 1994 glass structure design for the exhibition space. The English architects Caruso St John devised a system of screens covered with bright Le Corbusier wallpapers that preserved the building’s transparency and relation to its exterior garden, even while making possible an exhibition of photography in a building suffused with light. The parallel colored screens on which Demand’s works were hung were cut through so that the large, frameless luminescent photographs operated as views to another visual and imaginative plane. 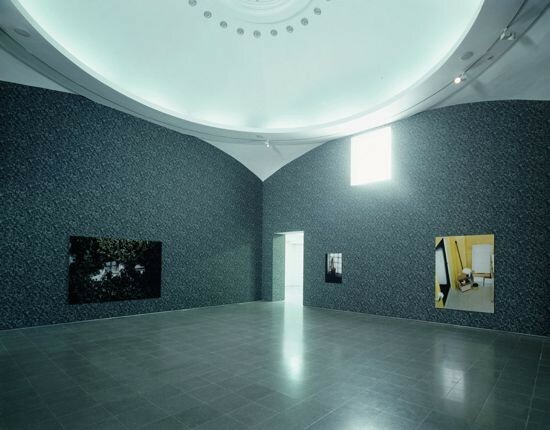 In 2006, Demand exhibited at the Serpentine Gallery in London, where he created an extraordinary backdrop for his work by covering the walls with of four different colors of ivy wallpaper of his own design. In consideration of the location of the Serpentine Gallery in Kensington Gardens and the venue’s history as a 1930s teahouse, this wallpapered environment allowed for a highly evocative transparency. In the same exhibition, thought and memory, inside and outside, the structure and relationships between things, light and dark, were given yet another dimension by the addition of sound in Demand’s 35mm-film loop Recorder. The stop-motion animation of the old-fashioned tape deck made out of paper, spinning in perpetuity, was accompanied by an endless, echoing version of the Beach Boys’ instrumental, Bicycle Rider. Installation view, Neue Nationalgalerie, Berlin, 2009. © Nik Tenwiggenhorn. 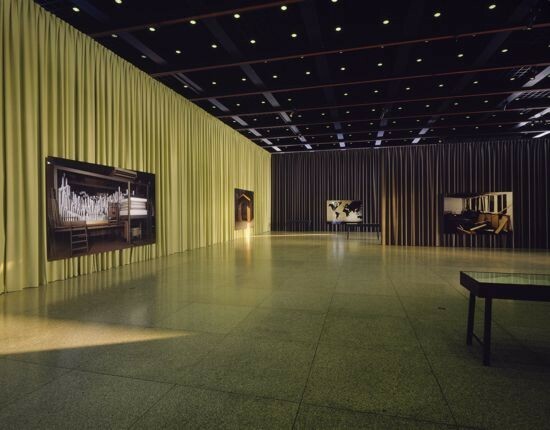 And in late 2009, Demand reunited with Caruso St John for his major exhibition at the Neue Nationalgalerie in Berlin. The collaborators transformed Mies van der Rohe’s 1968 glass box in the city center through the addition of floor-to-ceiling, heavy woolen curtains in a muted palette. As with Fondation Cartier, even as he recognized the glorious Modernism of Mies’ building, Demand used his work to provide another layer to the potent history surrounding the building and the city. Thomas Demand‘s work is currently on view in the 12th Venice Architecture Biennale, “People Meet in Architecture,” through November 21. Judy Annear is Senior Curator of Photography at the Art Gallery of New South Wales. See Shinro Ohtake, “An Indexical Survey of Tokyo in the Age of Cinema,” ART iT, August 2010 https://www.art-it.asia/u/admin_ed_columns_e/SFp7HuoKl2Vh6tUsT9fM/ accessed 8/2/10. See Beatriz Colomina, “Media as modern architecture,” in Thomas Demand, Serpentine Gallery, London/Schirmer Mosel, Munich, 2006, p 19. See http://www.newsstore.fairfax.com.au/apps/viewDocument.ac?page=1&sy=nstore&kw=murakami&pb=smh&dt=selectRange&dr=week&so=relevance&sf=text&sf=headline&rc=10&rm=200&sp=nrm&clsPage=1&docID=SMH100807ND4T23CDHKJ for an interesting discussion on Murakami, the recently released movie Inception and elevators. “A conversation between Alexander Kluge and Thomas Demand,” in Thomas Demand, op. cit p 86.